04.2014 Famous Famiglia announces the opening of its latest unit at the world’s busiest airport, Hartsfield-Atlanta International Airport – Concourse C.
03.2014 – Please visit our newest opening at San Antonio International Airport – Terminal 1. 11.2013 – Famous Famiglia opens its second location at Atlanta’s Hartsfield International Airport (ATL) at Concourse C. ATL is the world’s busiest airport processing more passengers than any other airport. Famous Famiglia plans to open its third location at ATL early 2014. Latest Opening at Quito International Airport in Ecuador! 08.2012 – Famous Famiglia is excited to announce its recent term renewal at San Antonio International Airport. 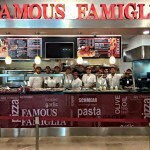 08.2012 – Famous Famiglia is excited to announce that it will be opening it’s first location in South America at the newly built Quito International Airport in Ecuador. This is also the company’s first unit to open with MERA Aeropuertos, which operates many global food brands throughot central and south America. 05.2010 – Famous Famiglia announces its latest opening at Milwaukee International Airport.